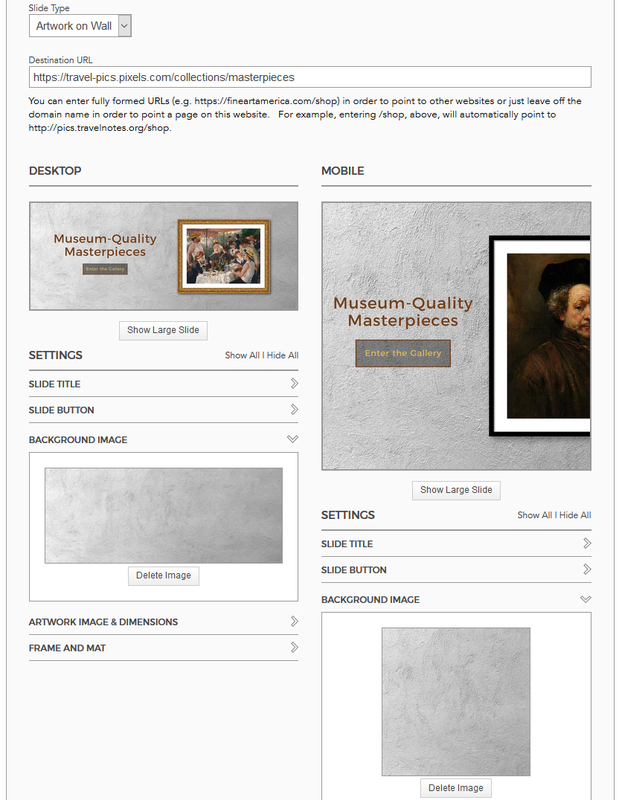 Making Custom Slides for Mobile from Fine Art America defaults. I'm not an expert with a paint program by any means, so if I can do this.... anyone can. To stop our images from appearing cut off in mobile, we need to make custom slides in square format. If, like me, you're not that talented in Photoshopping yet quite like the Fine Art America defaults - apart from the image cut off on the right - then here are a few simple steps to take. 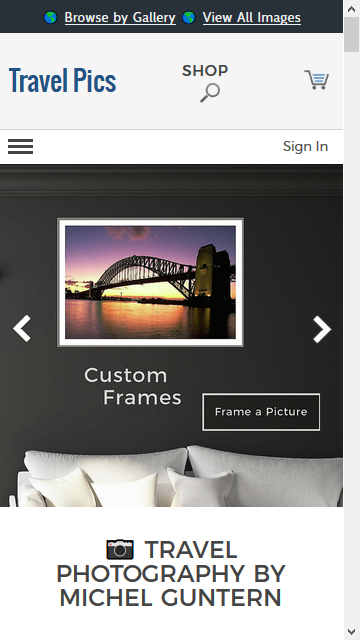 First, set up everything as usual; with default backgrounds and images from your portfolio. Then in the Homepage >> Slides editing tab, click on 'Background Image' links in the Desktop and Mobile columns to reveal the images. We now have four images. Right-click on these four images (one at a time) and choose 'Copy Image Location' if you want to see what they look like in another browser window first. Use 'Save Image As' to save a copy of the image to your hard drive, or 'Copy Image' if you want to paste it straight into your paint program (as new image). If you saved a copy of the images, then you can open them in your paint program later. We can now play around with the bits we like by copying them in a paint program from one of the FAA generated images and pasting the selections where they 'feel right' in our ready-to-go 'slideRoomMobileWall' image (the 1000x1000 square White Brick Wall background used for mobile). 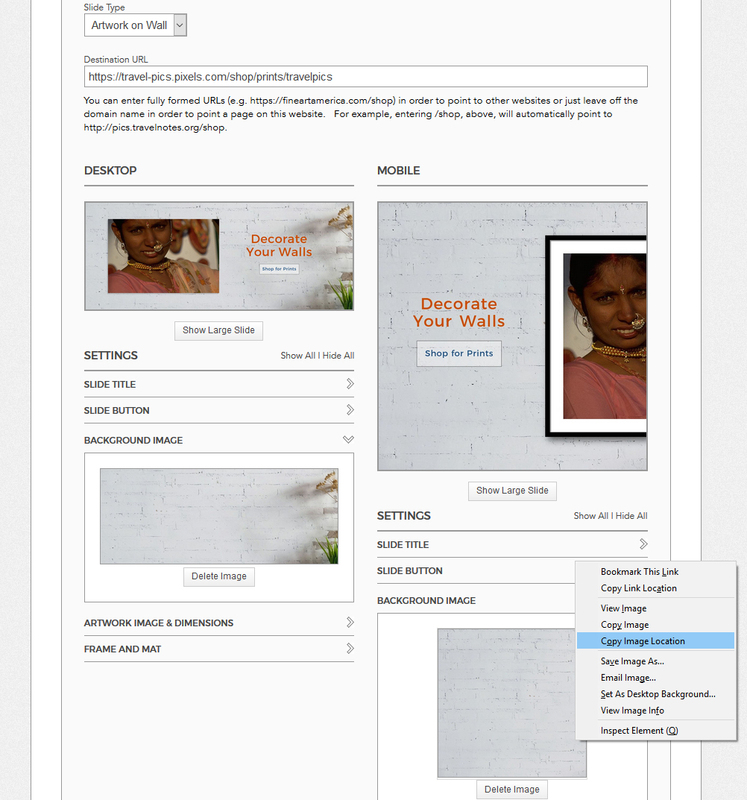 Save the image and upload it into your site from the Edit Homepage >> Slide tab. 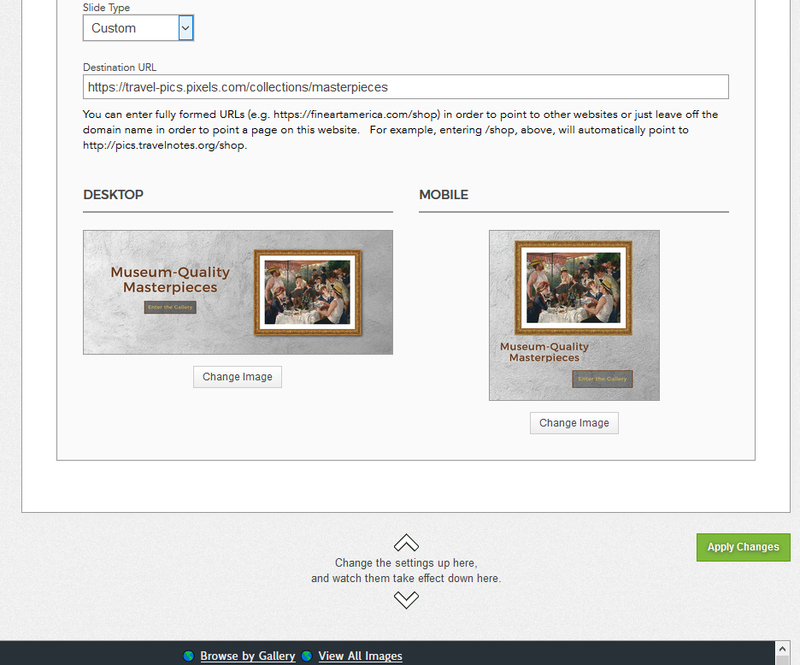 If you used the 1000x1000 default background image, there is no need to do any resizing. Select 'Custom' in the Slide Type drop-down and browse for the file to upload in the Mobile section. 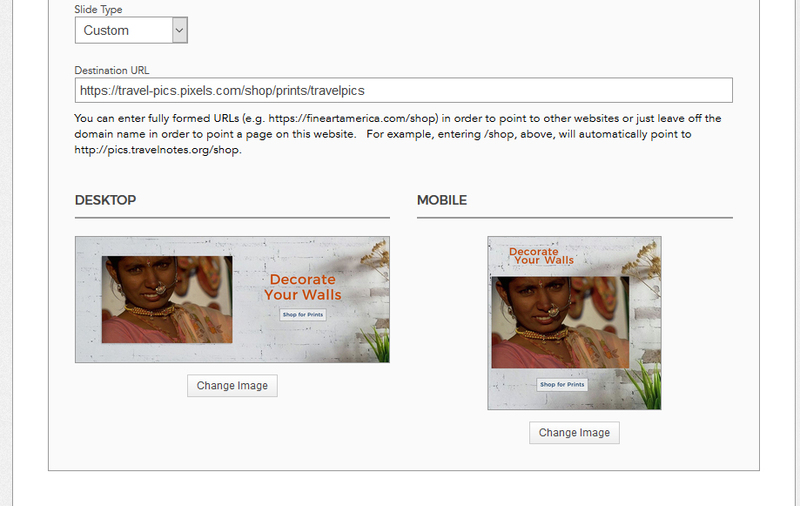 When adding a custom image for mobile, we need to add a custom image for the Desktop as well. Just use the Desktop image FAA created for us - the (/rendered/custom-slide?backgroundImageType=desktop&backgroundImageId=) one - by right-clicking on the original and 'Save Image As'; then Upload the image into the Desktop custom slot. 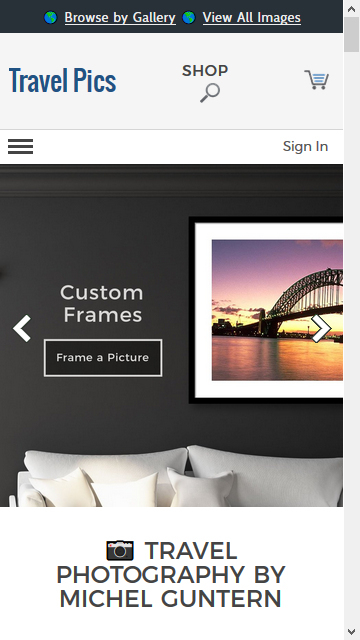 If anything goes wrong, we can easily switch between 'Custom' and 'Artwork on Wall'. The settings there shouldn't have changed. Using the same principal, here's another before and after for the second slide. 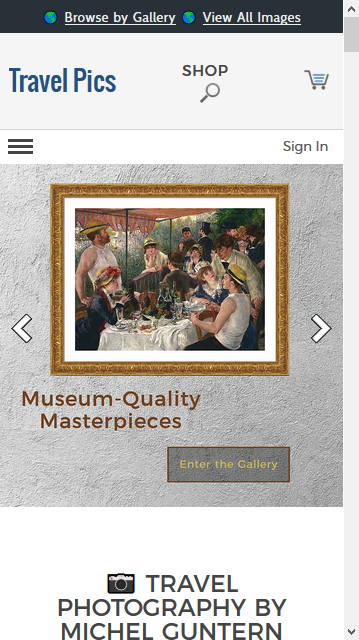 By default, Fine Art America shows three slides on the Version 2 Custom Website, but there is a fourth; with a different, built-in background available for artists to use. Making changes to this one was a no-brainer. Having half the image cut off on the default mobile view, means landscape orientations suffer more than portraits. Instead of using different images for 'Desktop' and 'Mobile' (above), I wanted to keep a similar look and feel. With these little Making Custom Slides for Mobile tips - using Fine Art America's default backgrounds - we can now have our gateau and eat it. So there you have it; the final before and after Travel Pics comparisons. Museum-quality travel photography prints can instantly transform your home or office into a spectacular location. Browse the Travel Pics Collection for prints and posters. 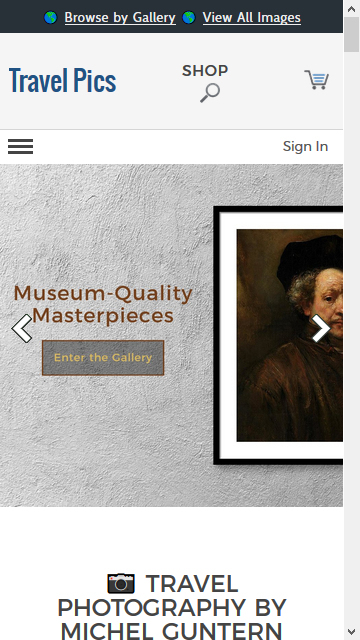 Purchase framed prints and canvases featuring original artwork on Fine Art America. These uniquely created travel images are also available to print on home decor products, spiral notebooks and other merchandise. 📷 Michel's Travel Photography has been published in travel magazines, guide books and syndicated around the world through established picture agencies. 📷 Artist Website: pics.travelnotes.org: A-Z Travel Pics Collections - Travel Pics Image Gallery. 📷 During 40 years of travel and living abroad Michel has visited over 120 countries, some 220 UNESCO World Heritage Sites and more than 100 of the World Heritage Cities. 📷 Now you can Travel Around the World in first-class comfort, with Michel's original travel photography decorating your walls. 📷 Feel free to share the images with your family and friends on Social Media. 📷 Are you looking for Horizontal or Vertical images? 📷 If you are searching for a specific image, please use our Contact Form. 📷 Browse Travel Photographs - Special Promotions. 📷 Travel Pics Royalty-Free and Rights-Managed Images ► Travel Photography for Editorial Use. Bringing Travel Photography to Life: Decorate your home and accessorize your life with beautiful images from around the world. Beach: Beach Towels, Round Beach Towels, Weekender Tote Bags. 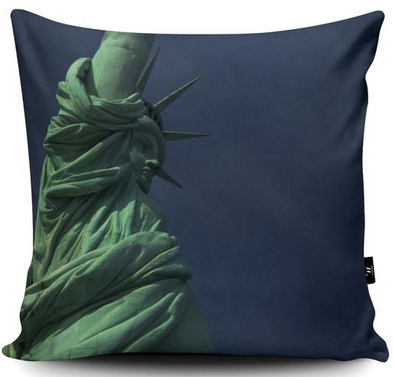 Home Decor: Bath Towels, Duvet Covers, Fleece Blankets, Hand Towels, Shower Curtains, Throw Pillows. Lifestyle: Carry-All Pouches, Coffee Mugs, Tote Bags, Yoga Mats. Men's Apparel: Baseball T-Shirts, Hooded Sweatshirts, Long Sleeve T-Shirts, Slim Fit T-Shirts, T-Shirts, Tank Tops, V-Neck T-Shirts. Miscellaneous: Greeting Cards, Limited Time Promotions, Spiral Notebooks. Tech: Galaxy Cases, iPhone Cases, Portable Battery Chargers. 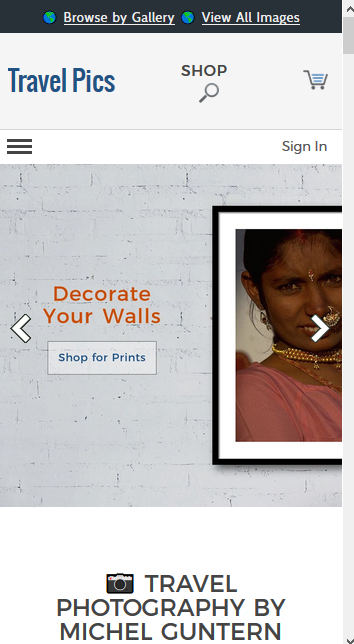 Wall Art: Acrylic Prints, Canvas Prints, Framed Prints, Metal Prints, Photographic Prints, Posters, Wood Prints. Women and Children: Baby Onesies, Junior T-Shirts, Kids T-Shirts, T-Shirts, Toddler T-Shirts, V-Neck T-Shirts. We're been reworking our image pages to expand on the back story. Visit them to find out more about the locations behind the pictures. 🖼 Rajasthan Prints on Fine Art America. Michel's Travel Pics can decorate your home or office wall thanks to the fine people at Fine Art America. Fine Art America fulfils each order; taking care of the printing, framing, matting, packaging and shipping. Each print is delivered 'ready-to-hang' and comes with a 30-day, money-back guarantee. 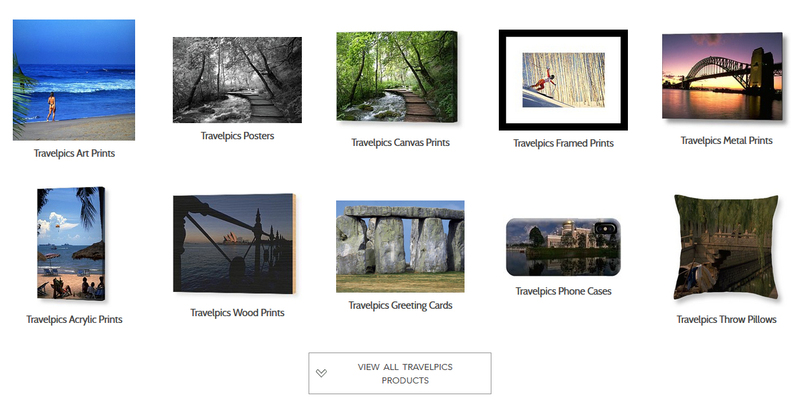 These original travel photos are also available to print on home decor products and other merchandise. 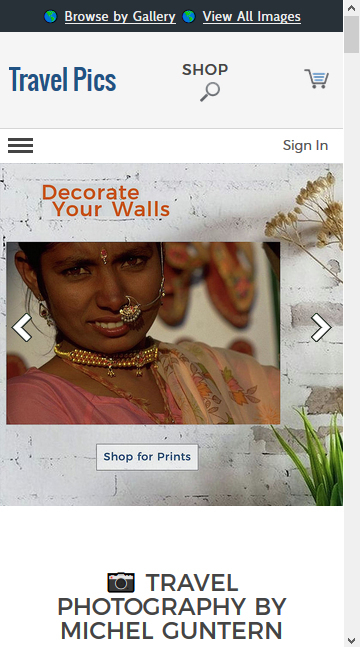 Decorate your home and accessorize your life with beautiful images from around the world. A - Titles, Africa, Asia, Autumn, B - Titles, Black and White, Blue, Bridges, C - Titles, Caribbean, Cyclists, D - Titles, E - Titles, Europe, F - Titles, G - Titles, Getty Images, Green, H - Titles, Horizontal, I - Titles, J - Titles, K - Titles, L - Titles, Landmarks, M - Titles, Masterpieces, Middle East, N - Titles, No People, North America, O - Titles, Oceania, P - Titles, People, Q - Titles, R - Titles, S - Titles, South America, T - Titles, Transport, U - Titles, V - Titles, Vertical, W - Titles, Wall Calendar, Winter, World Heritage, World Wars, X - Titles, Y - Titles, Z - Titles. Alpine, Blue, Bridges, Candid, Green, Italy, Landmarks, Landscapes, Mountains, People, Railways, Red, Rivers, Snow, Sunsets, Switzerland, UNESCO, Water. 👉 Blogging on Fine Art America 🎖 Join the Top Travel Pics Group 🏖 License Travel Photography Images. 🎨 Artists and Photographers on Instagram 🖼 Tweeters on Fine Art America 📟 TravelTweets 🌄 View Collections 🕵 View Images. 🎨 Artists and 📷 Photographers on 🖼 Instagram. 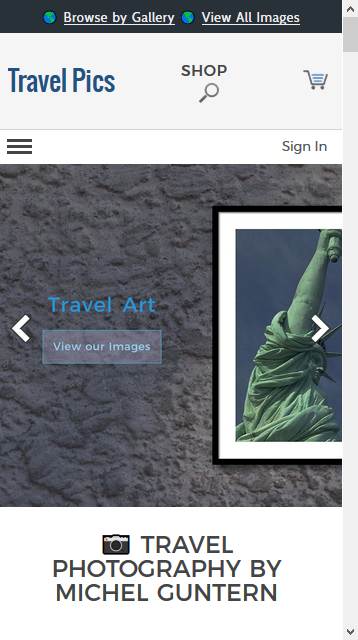 🎨 Custom Artist Websites - 🌄 TravelTweets. Every National Park In The Lower 48 States. World Traveler 🌎 Photographer 📷 Pilot. 🌷 Nature 🐊 Wildlife 🗻 Landscape. Prints from France, Italy, Croatia, USA. Professional artist specializing in Ballpoint Pen Art. Images from my travels and places I've called home. Creator 4 interior design projects & staging. Become part of the scene. Published photographer based in Nottingham, England. Cheerful, creative, and colorful photographer who loves to find the joy in our world. Known for the Art Fusion Gallery, during International Art Basel Miami 2017. Fine Art Black & White Photography. Filmmaker/photographer ° Lover of film. Photographer Colorado School of Mines 2020. Richmond, VA-based aerial photography firm. Roaming the backroads and wild places of America. Post Modern Artist, Art School Ideas Applied to Masterpieces. Creating images that inspire insightful dialogue among viewer. Landscape and nature photography, with a focus on Switzerland, Europe and USA. Charleston SC based | outdoor | landscape | architectural | real estate | aerial | photographer. Images brought to you by the love of nature. Nature and wildlife photographer / Conservationist. Based out of Houston, Texas. Connecticut photo workshops / Fine art / landscapes. Photographic art for personal and business spaces. Nature, landscape, fine art, and travel photographer. Artist & illustrator makes custom painting for interior decor. I enjoy travel, computers and cameras. Irish artist who lives in Sao Paulo. Photographer and a graphic designer located in Poland. Nashville Based Internationally known Photographer. Love adventuring with a camera in hand! Artist and Photographer based in Maine. Pro photographer in Colorado specializing in wildlife, nature, retro & travel photography. Unique creative art unlike anything else. The Renaissance Woman with intuition driven passion for art, photography and life. Photographer, inspired by nature and ordinary things. Photography from my travels and more. My love of nature and travel is expressed through my images as I see the world through my lens. Street Artist Creating Visual Stories For Your Palate. Nine to fiver...portrait artist...digital doodler Wigan, UK. Fine art photographer from Florida, world traveler, illustrator. All about photography and digital art. Georgia Artist - love geeky subjects and beautiful and historic places. Photography Enthusiast Future Civil Engineer University of Akron. Photography - Travel - Chocolate - Fineart - Homedecor. One of a kind Photo Realistic images. New York - fifties-style noir and sparkling city vistas. A Moment in Time with a Sense of Place. Bird & Wildlife Photographer | Greenwich CT.
Love paint, paper, and all things colorful. Nina Stavlund & Tony Beck focus on travel, birding, photography, nature & wildlife. Beach and City Skyline Photography. Arizona based landscape and nature photographer. Original photography and old image restoration. Love sharing NJ and NYC beauty. Commercial Photographer & Cinematographer based in Orange County. Fine art photography for discerning clients. Artist, Artrepreneur, Painter, Designer, Contemporary Fine Art. Artist living in Botswana, Africa. 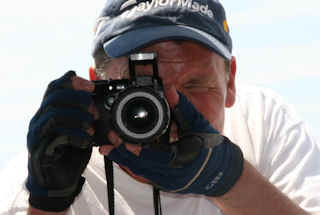 Freelance photographer and Scuba Diving Instructor. Historic photos, travel photos, art photos, fantasy art, and cool travel maps. Popular illustrator - followed by FineArtAmerica. raveling through life, sharing the world I see. Travel Photographer & Blogger exploring the United States. Freelance photographer, creative, nonconformist, nature lover and inquisitive adventurer. Artist (illustrator of the Teen Wolf Bestiary). From the Jersey Shore 🌅 Photographer. 'Imagination is more important than knowledge' - Albert Einstein. Photographer living in Salem, MA. 📚 Author: NY Through the Lens + NY in the Snow. 📷 Visited over 120 countries and some 220 UNESCO World Heritage Sites in 35 years of #travel and living abroad. Founded TravelNotes.org in 1997. Travel-Write.com soon followed to expand on our travel articles. 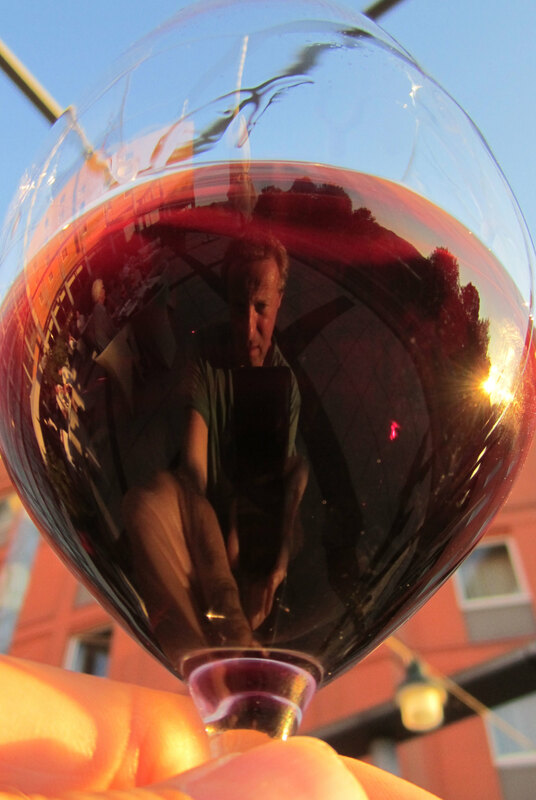 Reflecting on a glass of red wine beside the River Danube, in Linz (Austria). I've been submitting a selection of my royalty and travel photography images to EyeEm since Queen Elizabeth II's 90th birthday. During my first week on the site, I have discovered some very talented photographers; while browsing through the awesome photo collections EyeEm members have collectively assembled. I've also been impressed by the generous nature of EyeEm photographers toward each other and the hours of hard work the whole EyeEm team put in daily; to highlight Market Trends and provide the Community with regular Features, Missions and Tutorials that can only help us improve our lens craft, gain more exposure and sell image licenses to photo buyers. Which 3 Travel Photos are you most proud of from your travels in 2017? As always, the rules are simple. 1. Colour Travel Photography Only. The images must be unaltered (no heavy processing) coloured photographs, illustrating the best of Travel and Tourism in 2017. This means no black and white or sepia images, no paintings, and no 'digital artistic' evolutions. We're looking for Travel Photographers, not masters of photo-editing software. 2. No Fine Art America watermarks. No other added text or borders should appear on the photos either. * 3. Photos need good titles and descriptions. Being a member of Top Travel Pics is not a requirement but members may be featured in the group gallery and promoted on our Travel Photo Newsfeeds. Sponsored by the Top Travel Pics group, entries that do not follow our submission guidelines will be deleted. ► Images that are considered weak will also be removed from competition. Our Travel Photography Contests are open to anyone with photos hosted on Fine Art America. Remembrance Sunday is the second Sunday in November, the Sunday nearest to 11th November - Armistice Day; when on the 11th hour of the 11th day of the 11th month in 1918, the guns of the Western Front fell silent after more than four years of deafening noise, death and destruction. To commemorate the centenary of the First World War years (1914-1918), the 2015 Travel Notes Calendar remembered the fallen. As we continue to remember at this time of year, the 2018 edition is now available for purchase. You may also click on the photographs below, to find out more about each individual image. January - World War One Trenches. 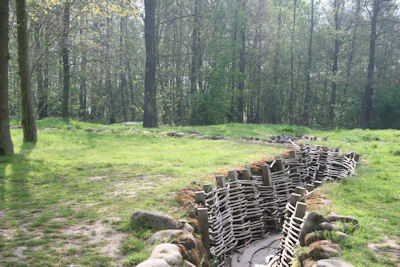 This reconstructed section of original German trench system is located about 2km north of Wijtschate. February - Hill 60 Cratered Landscape. Located on Zwarteleenstraat in Zillebeke, south-east of Ypres, the cratered landscaping of Hill 60 bears the scars of a silent witness to an underground war of mines and counter-mines. 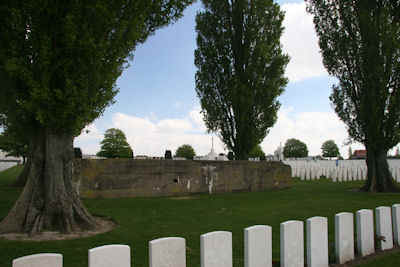 March - British Cemetery at Messines Ridge. 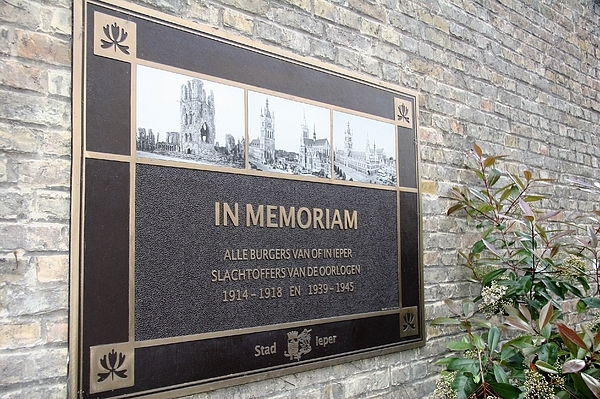 Messines Ridge British Cemetery is located 10km south of Ieper on the Nieuwkerkestraat, outside Mesen. April - German Bunker at Tyne Cot Cemetery. Tyne Cot, the largest Commonwealth military cemetery in the world, contains two large concrete bunkers which once formed a part of the German defensive line on the ridge at Passchendaele. 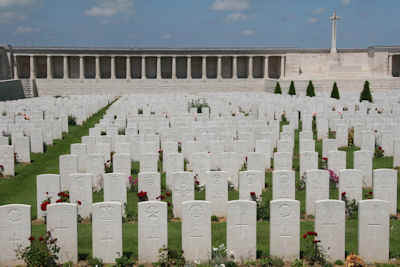 May - Pozieres British Cemetery and Somme Battlefields. 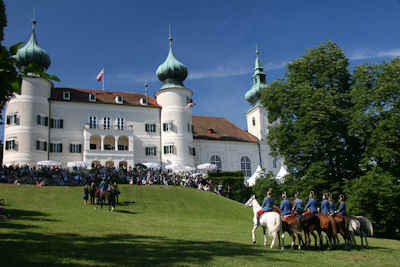 June - Artstetten Castle in Memory of Archduke Franz Ferdinand. The Archduke Franz Ferdinand and Sophie, Duchess of Hohenberg were interred at Artstetten Castle because his wife could not be buried at the Imperial Crypt. July - American Battle Monuments Commisssion. 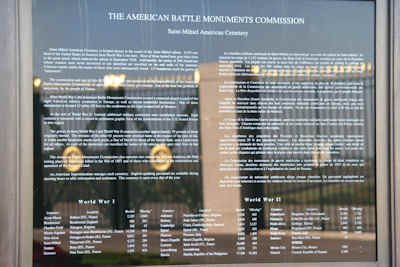 American Battle Monuments Commission maintains 25 permanent American burial grounds, and 26 separate memorials, monuments and markers on foreign soil. 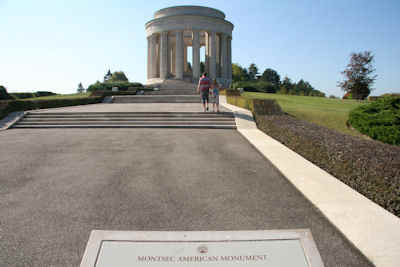 August - Montsec American Monument. The American First Army in its offensive operation of September 12-16, 1918 reduced the strongly fortified St. Mihiel salient, capturing 15,000 prisoners, 450 cannon and 700 square kilometers of territory. 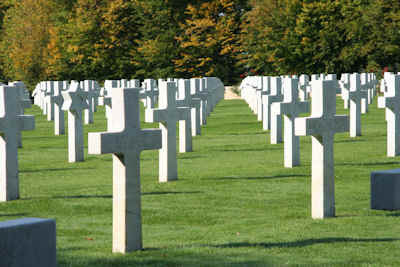 September - Saint-Mihiel American Cemetery. The 1918 Battle of Saint-Mihiel, from September 12th to 15th, was the first independent battle of the American Expeditionary Force in the First World War. 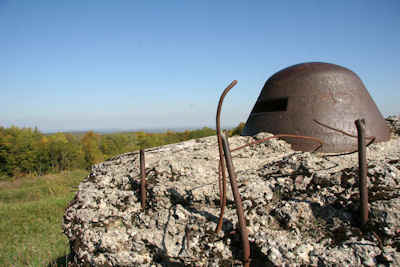 October - Fort de Douaumont, Verdun. The Germans captured Fort Douaumont on 25th February, 1916 without a contest. The Colonial Infantry Troops of Morocco finally recaptured it on 24th October, 1916. November - Armistice Signing in Compiegne. 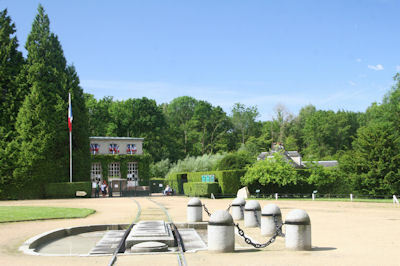 Fighting on the Western Front ceased at the 11th hour; on the 11th day, of the 11th month after The Armistice was signed in the forest of Compiegne in 1918. 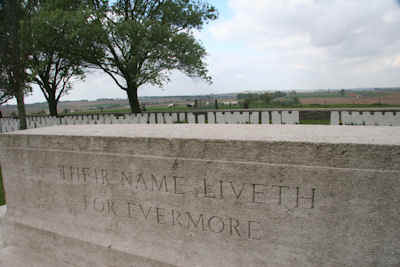 December - Their Name Liveth For Evermore. 'Lest We Forget' comes from a poem, Recessional, written by Rudyard Kipling. Kipling also created other iconic memorial wordings, including 'Known Unto God'. If you can't lie back and relax on a rickshaw, then perhaps you need a yoga mat. Our premium yoga mats are 24" wide by 72" tall and 0.25" thick. Our yoga mats are printed on-demand and available to ship to any destination in the world within 2 - 3 business days. As mentioned in the initial Travel Photographer of The Year 2016 blog post, we are holding a number of keyword subject contests over the coming year, with competing photographers earning points in each contest as they work towards a final score. Three points for an Editor's Choice award and a bonus point if an image was taken specifically for the contest and posted in the contest's discussion thread in the Top Travel Pics forum. One (People's Choice) point may also be awarded to one or more images near the top of the Winners' leaderboard (with at least five votes) when public voting is finished. Special scoring to be announced for the final rounds, to keep things interesting. Autumn Travel Photography: 1 Bonus Point for Community Votes to Priscilla Burgers and Stacey Brooks. People Travel Photography: 1 Bonus Point for Community Votes to Peteris Vaivars and Karen Wiles. Travel and Transportation Photography: 1 Bonus Point for Community Votes to RicardMN Photography and Iryna Burkova. 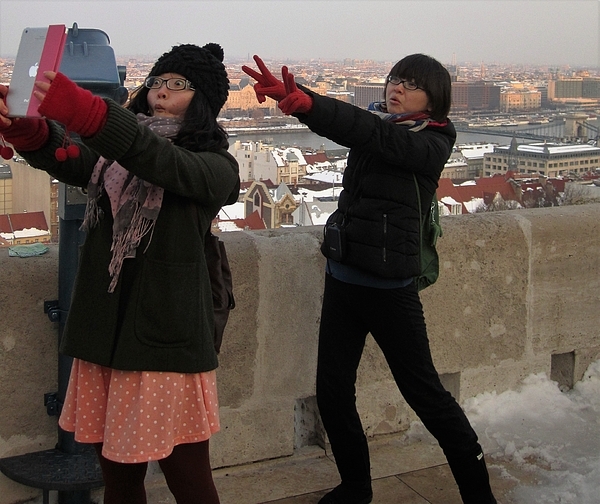 Christmas Abroad Photography Contest: No Bonus Points awarded. Bridges Travel Photography: 1 Bonus Point for Community Votes to Jane Linders and Iryna Burkova. Winter Travel Photography: 1 Bonus Point for Community Votes to Irina Hays and Inge Riis McDonald. Landmarks Travel Photography: 1 Bonus Point for Community Votes to Inge Johnsson and Ivan Slosar. Hotels and Accommodation: 1 Bonus Point for Community Votes to Peg Donnellan and Nikolyn McDonald. Famous Lakes and Rivers: 1 Bonus Point for Community Votes to Carolyn Derstine and Karl Anderson. Village Life: 1 Bonus Point for Community Votes to Denise Mazzocco and Buddy Mays. Markets: 1 Bonus Point for Community Votes to Toni Abdnour and Steve Sturgill. Landscape Travel Photography: 1 Bonus Point for Community Votes to Bob Phillips and Janis Knight. Beaches Around The World: 1 Bonus Point for Community Votes to Michele Avanti and Cascade Colors. Cities Around The World: 1 Bonus Point for Community Votes to Carlos Amaro. Travel Up Close: No Bonus Points awarded. Religious Buildings Around The World: 1 Bonus Point for Community Votes to Priscilla Burgers. 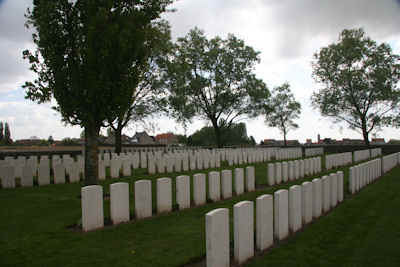 War Graves and Battlefields: 1 Bonus Point for Community Votes to Julia Gavin and Hugh Smith. With only eighteen images left, after we removed the duds, just one photographer received premium points. Terry Cooper LRPS was awarded 12 points for Piazza San Martino. Autumn (3), People (3), Bridges (3), Landmarks (3), Hotels (3+1), Village Life (3), Markets (3). Winter (3), Village Life (3+1), Markets (3), Beaches (3), Up Close (3). Terry Cooper LRPS: Belfast, Northern Ireland. People (3), Landscape (3+1), Beaches (3). People (3), Landmarks (3), Markets (3). Autumn (3+1), Religious Buildings (3+1). Village Life (3), Battlefields (3+1). Jane Linders: Maryland Heights, MO. Bridges (3+1), Lakes & Rivers (3). Up Close (3), Religious Buildings (3). 14 Photographers are on 4 Points - and 98 Photographers have 3 Points. 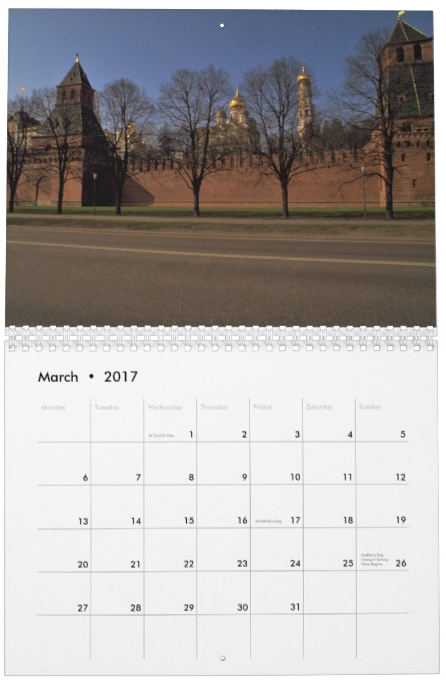 The 2016 Travel Photographer of the Year contest came to a close with a challenge 'to put together a 2017 Fine Art America Travel Photography Calendar featuring the best travel photography to represent each month of the year'. Entrants could submit up to ten images (only one per month) and 10 points would be awarded to each image of the month (original blog post). If more than one image was selected for a particular month, the points would be shared. Once the usual duds that didn't adhere to the rules were deleted, the real challenge started; to pick the winners. January - Salzburg, Austria by Shirley Mitchell. January in Wyoming by Buddy Mays. The Universal Language - Denver in January by Nikolyn McDonald. Snow Geese - February Migration by Nikolyn McDonald. March - London Shades of Evening by Shirley Mitchell. March in Costa Rica, Arenal Volcano by Buddy Mays. Hunter's Season - March by Nikolyn McDonald. April in Paris, Luxemborg Gardens, Paris by Buddy Mays. May - Stormy Weather by Shirley Mitchell. May and a Moonrise, Florida Keys by Buddy Mays. 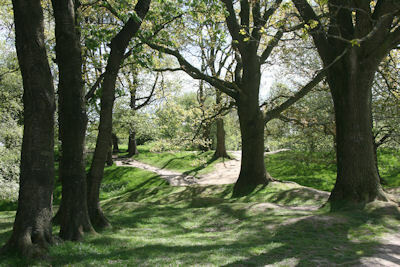 Quiver Trees - May by Inge Johnsson. Rainy Day in June - Montmartre, Paris by Nikolyn McDonald. Morning Matterhorn on Grindjisee in June by Two Small Potatoes. Colorful Houses of Curacao July by Adriana Zoon. August, Life Under an Acacia Tree by Buddy Mays. September - Historic Clapper Bridge by Shirley Mitchell. Pumpkin Hunting, October by Two Small Potatoes. November - Portsmouth Harbour by Shirley Mitchell. December Snow People by Buddy Mays. Win one year's hosting for your travel photography by entering our end of year finale. With 120 points on the table, anyone could still wrap this up. To be in with a chance of winning you need to Read The Contest Rules, follow the brief correctly, and enter your best images that fit the instructions. That's the easy part. Ignore the rules and your entries will meet the same fate. I've run a number of travel photography contests and I can safely tell you that the easiest way not to win is to ignore the terms and conditions of entry. The hardest part of judging travel photography contests has been deleting entries that do not comply with the rules; but it's getting easier. 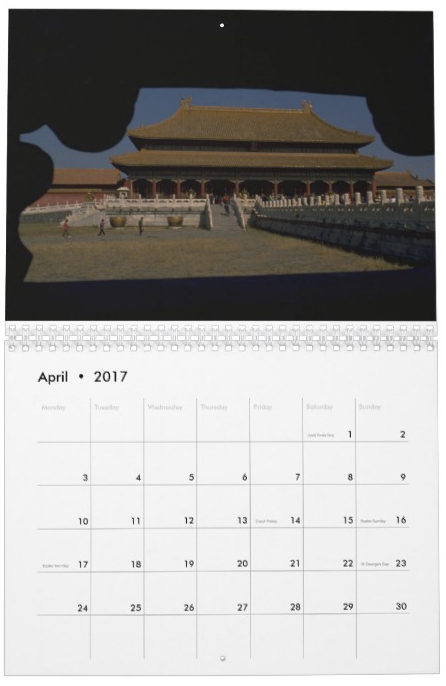 If we were to put together a 2017 Fine Art America Travel Photography Calendar we would need the best travel photography to represent each month of the year. You may submit up to ten images for consideration, but only one image per month. 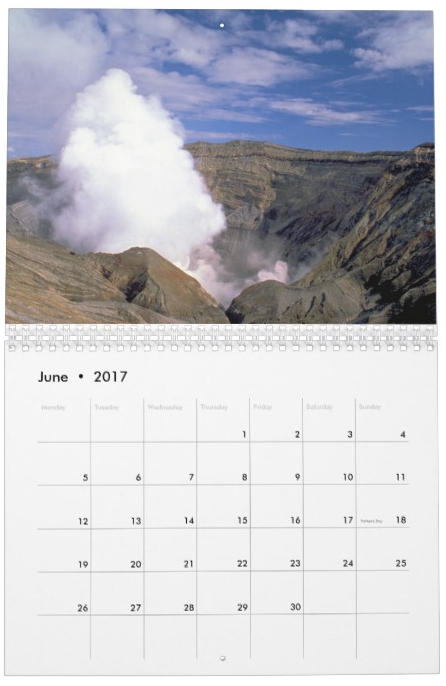 The month must be in the title and there must be a description for the photograph relating to that month. If you don't want to change titles and descriptions for images you have already uploaded (I don't blame you), I suggest you make new uploads of the image and add the appropriate title and description. 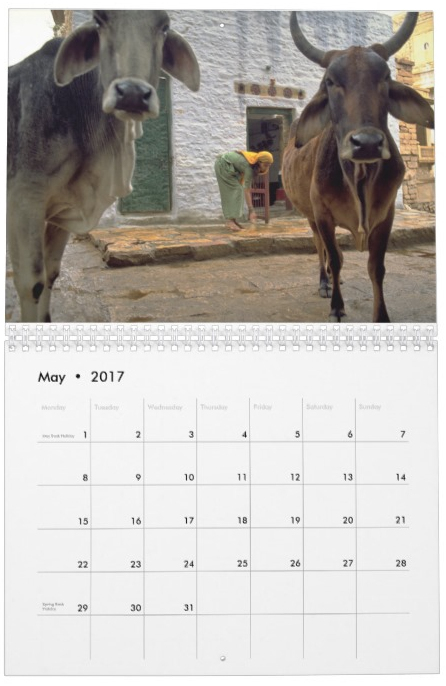 If you wish to enter ten different monthly images, you may want to put them all in a separate contest gallery. 10 points will be available for each month; making a total of 120 points (although any one photographer may only earn 100 points - obviously). If more than one photograph is considered suitable for a particular month, the ten points for that month will be shared. No other text nor copyright notices should appear on the photograph either. If you're worried about theft of images, don't put them online. * 3. 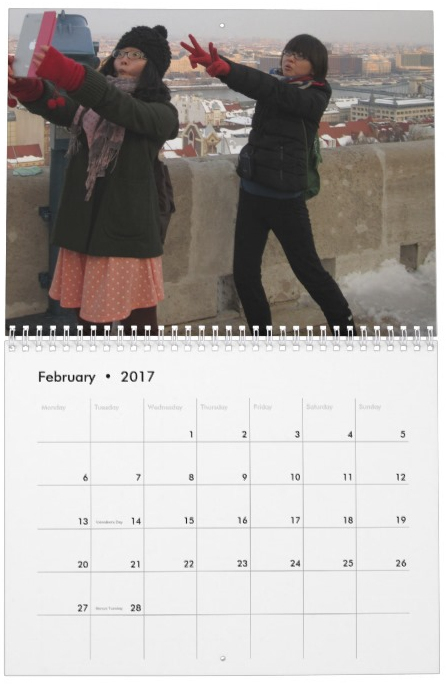 Photos need good descriptions and The Month MUST be in the title. ► Sponsored by the Top Travel Pics group on Fine Art America, entries that do not follow our submission guidelines will be deleted. Enter Contest on Fine Art America. Any contest updates will be added here. Leaders in the year-long challenge to be considered the best Travel Photographer on Fine Art America. Can you catch them? 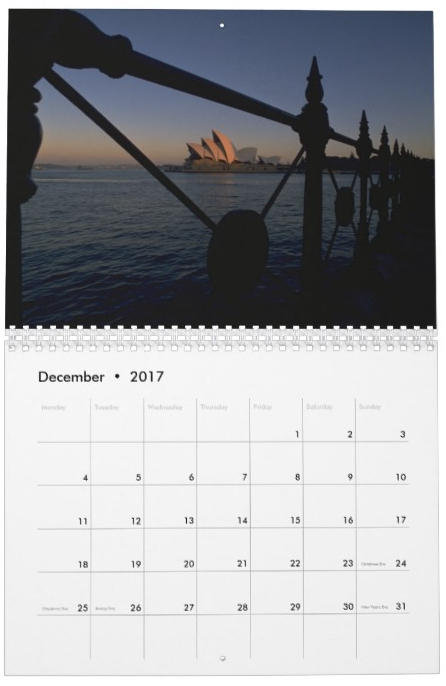 If you collect travel photography calendars, the Travel Notes 2017 Travel Photography Calendar is available to buy online; just in time for Christmas. 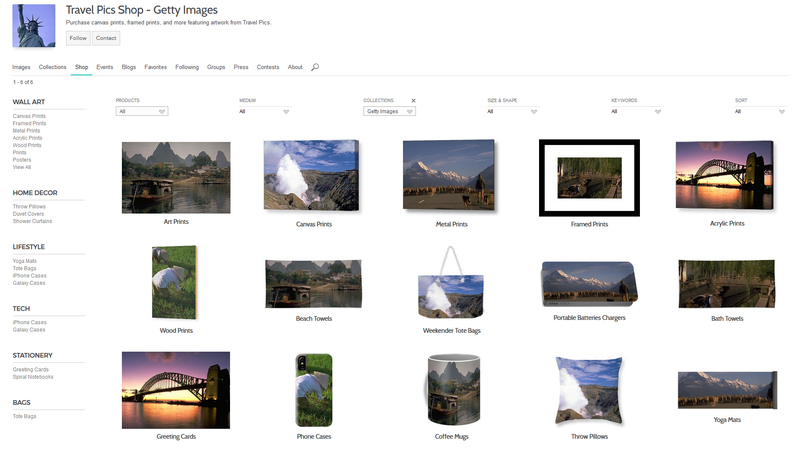 Individual prints are also available for that special place on your wall, or you may choose to print these unique images on home decor products and other merchandise. 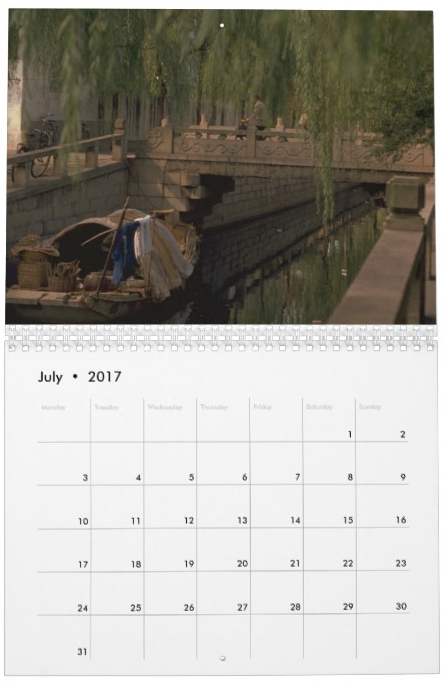 Bangkok Floating Market graces the 2017 Calendar Cover. 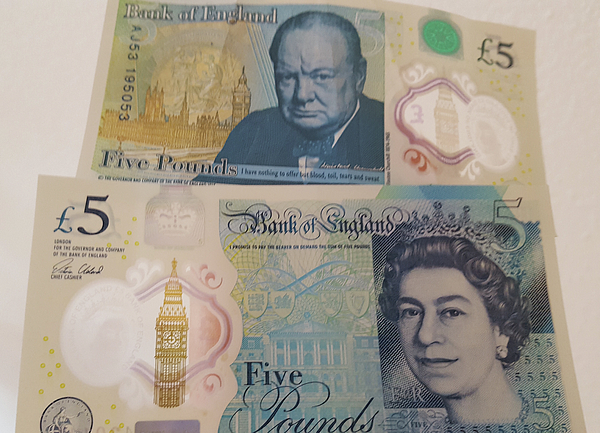 On Monday I was admiring the new five pound notes in London and by Wednesday we were being told that perhaps some people shouldn't be handling them, after the Bank of England admitted that the new five pound notes contain animal fat, sparking something of an outrage among vociferous vegans and vegetarians on social media. According to a Bank of England reply to a tweet on 28th November, 2016 the new plastic fivers are made with a trace of tallow (Hi @Jools_Orca there is a trace of tallow in the polymer pallets used in the base substrate of the polymer �5 notes); a substance derived from boiled carcasses of animals and used in the making of many candles and soaps. The main components in rendered animal fats can also be found in thousands of other everyday products, including lipstick, plastic bags, cycle tyres, crayons, and latex condoms. Designed to be cleaner, safer, stronger and flexible the new �5 polymer note is the first of the Bank of England's currency notes not to be printed on paper. For all their flexibility, the new fivers do bend and it is advisable not to fold them, says Bank of England governor Mark Carney, as it could damage the plastic. There was also an uproar when Sir Winston Churchill was chosen to be featured on the rear (replacing 19th-century welfare reformer Elizabeth Fry, one of only two women to appear on British currency not including the Queen of England) which just goes to show that you can't please everyone. I actually like the note and the printed Winston quote: 'I have nothing to offer but blood, toil, tears and sweat'. Polymer tenners are scheduled to be introduced in 2017, featuring Jane Austen (with the quote: 'I declare after all there is no enjoyment like reading'); and plastic twenties could be in circulation by 2020. Whether your prefer tea or coffee, or maybe even hot mulled wine at Christmas, you'll love these affordable coffee mugs and teacups from around the world. Our ceramic coffee mugs are available in two sizes. When I visited Havana, Cuba the Soviet Union was still intact and Fidel Castro was a very popular revolutionary figure around the Caribbean's largest island. Cuba in The Time of Castro. Sure some people wouldn't talk about politics, even if they wouldn't be heard, but to outlast nine American presidents is no mean feat. Fidel finally passed away at the age of ninety and many would remember him as a global icon. On the northern coast of the island, the port of Havana is situated on one of the safest harbours in the world; less than 100 miles from Key West. 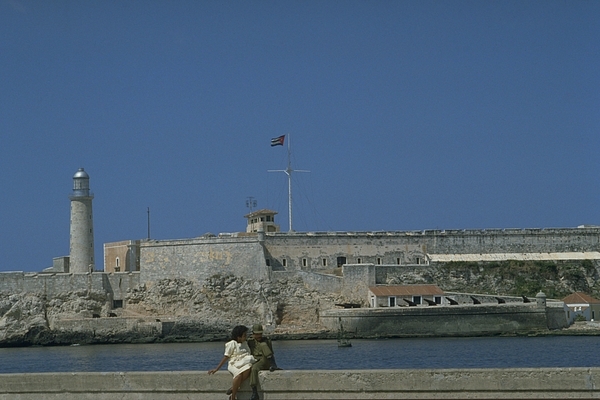 Havana's 16th-century Fort Morro is in good condition and affords a wonderful view of the city. Although there were many shortages in Havana, due to the US trade embargo back then, it was still one of the most interesting places to visit in Latin America. Another old fortress, that was built to protect the Havana approach, is Castillo de la Punta; on the western side of the strait. The old city, with its narrow, crooked streets, and historic landmarks is near the inner entrance to the harbour. You can even have a drink in Ernest Hemmingway's favourite bar; if you don't mind sitting shoulder to shoulder with tour groups in straw hats. The Cathedral of the Immaculate Conception dates from 1656. You should also visit the former palace of the colonial governors; now the City Hall. It was completed in 1792 and is an excellent example of Spanish colonial architecture. The city post office dates from 1575 and was once the Church of San Francisco. The main boulevard is the Paseo de Marti, or Prado, while the Avenida del Puerto extends along the edge of the bay, for cooling breezes on a humid evening. If you can't make it to Cuba, enjoy this wonderful scene. 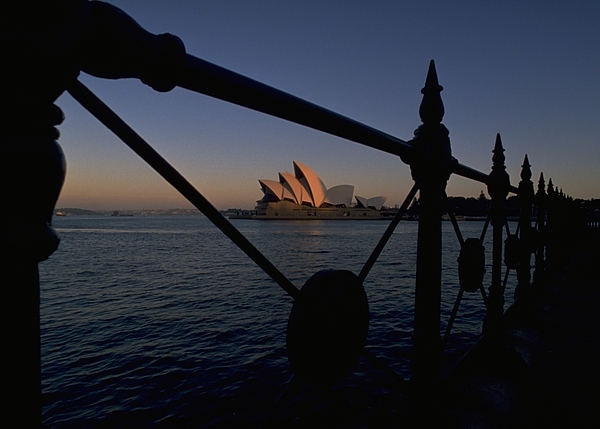 Sydney Opera House (UNESCO World Heritage site) at dusk, taken from an interesting perspective on Olympic Drive. This photo was used on the cover of Nomadic Gatherings: Travels in Asia and Australia. Located on Australia's East Coast, Sydney is the state capital of New South Wales. Whether you're looking for fun on the beach or experience some culture, Sydney is an amazing city that offers both. After a day in the Bondi surf, maybe spruce yourself up and spend a night at the Sydney Opera House. If you can't be there in person, you can always have a framed picture on your wall. 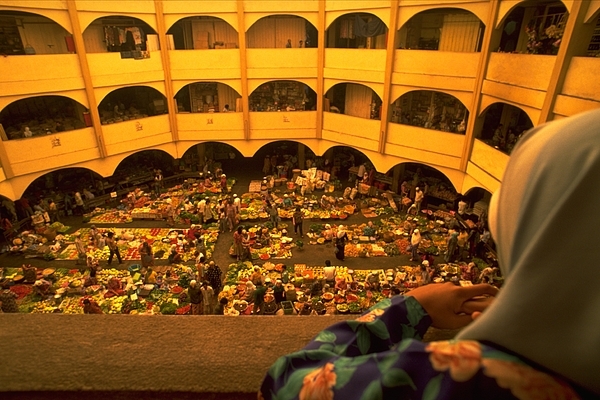 Overview of shoppers and market vendors at the colourful indoor vegetable market in Kota Bahru, Malaysia; some in traditional Malay dress. 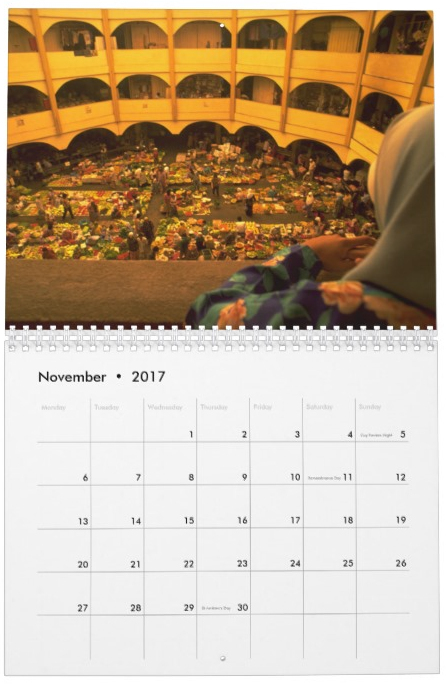 Muslim woman sell fresh vegetables from a seated position on the floor; while others watch the rituals of Kelanten daily life, from above. Visiting a food market on our travels is a great way to gain an insight into the local culture and a taste for the main ingredients that go into the regional dishes. For the photographer, there's plenty of colour on display and an array of opportunities for candid photography. 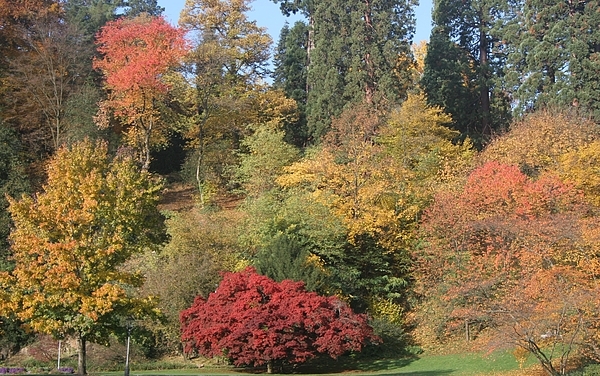 Driving through Baden-Baden, a spa town in south-western Germany's Black Forest region, in the early hours of Halloween, the morning mist gently lifts as the sun picks out the autumnal colours of the leaves decorating the trees in the famous Kurgarten. Nature presented the perfect photo opportunity in the spa garden before the crowds of morning shoppers arrived. If you're looking for colourful reminder of Autumn for your wall this could be the ideal image for you. Guilin is flat enough to cycle around and then these magnificent limestone peaks rise up in front of you. 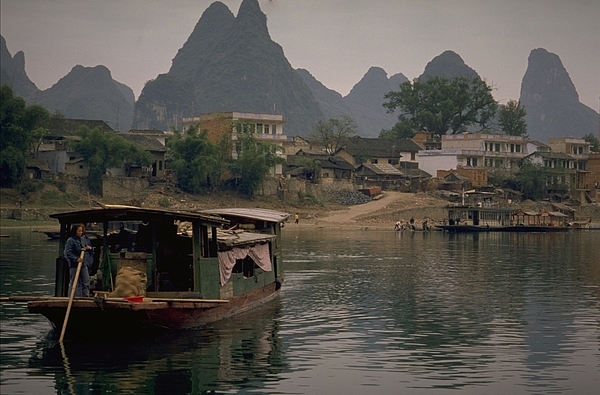 A cruise down the river, from Guilin to Yangshuo, passes through some of China's most magnificent scenery. Nature has spent 70 million years perfecting the sculptures around this part of the Li River; revealing a landscape that is truly awesome. Located in the centre of New Zealand's South Island, Mount Cook (Aoraki) is New Zealand's highest peak. 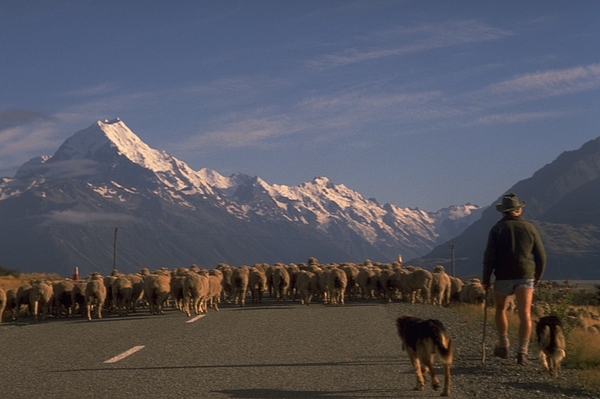 For many, an image of New Zealand might include the snow-capped mountain of Mt Cook, or sheep. And they wouldn't be far wrong. One might have to be really lucky to be presented with a picture of both in the same frame though. 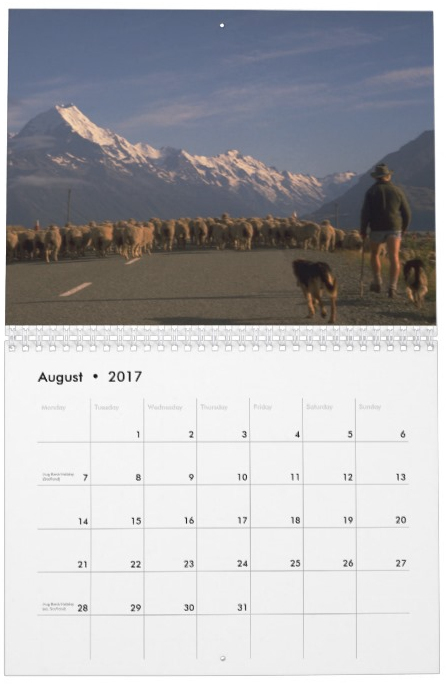 While hitch-hiking through the Mackenzie region, I couldn't believe the scene in front of me when our car was held up by sheep on the road to Mt Cook. The once in a lifetime view just cried out to be framed. Located about 100km west of Shanghai, Suzhou is famous for its canals, bridges and classical gardens; collectively an UNESCO World Heritage Site. With the Yangtze River Delta to the north-east and surrounded by lakes, it's not surprising Suzhou is often called 'Venice of the East'. 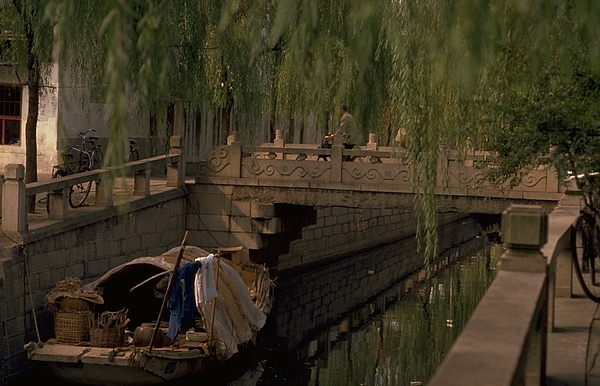 There's even a Grand Canal running through Suzhou, north to south, connecting Beijing with Hangzhou. 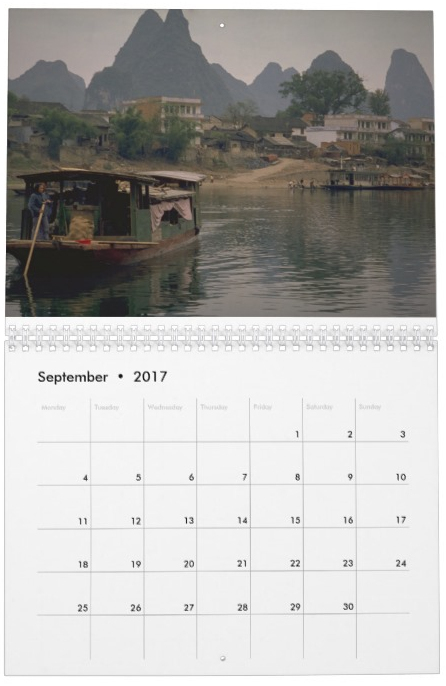 While many tourists might choose the easy option and take a boat tour on the Weichang River, it's easy enough to walk around on foot and discover the quiet backwaters of this 2,500 year-old city; founded in 514 BC as Helu, in the Kingdom of Wu. An old Chinese proverb says, 'In heaven there is paradise, on earth there are Hangzhou and Suzhou'. 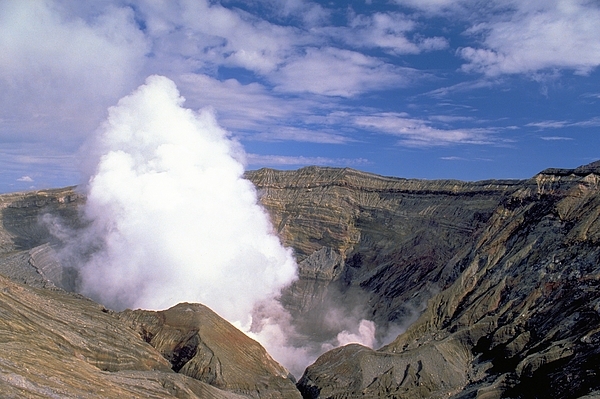 Located in Aso Kuju National Park, near Kumamoto on the island of Kyushu, Mount Aso is the largest active volcano in Japan, and is among the largest in the world. 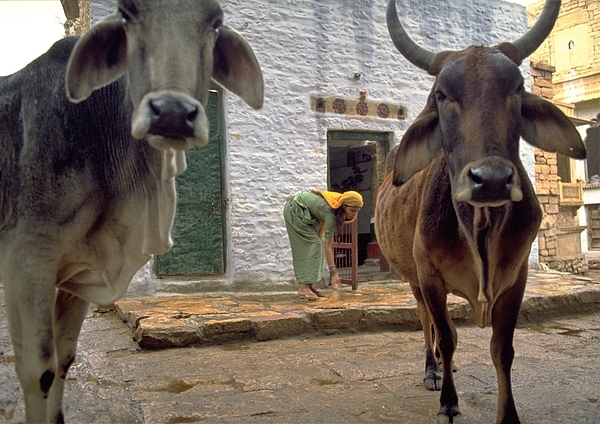 The cow is sacred in India; and woe betide the driver who doesn't swerve into a field to avoid them. Cows are not penned into fields here, and in the smaller towns and villages they wander wherever they like. It is even said that some people in India might like to come back as a cow in the next life. Now there's a thought. 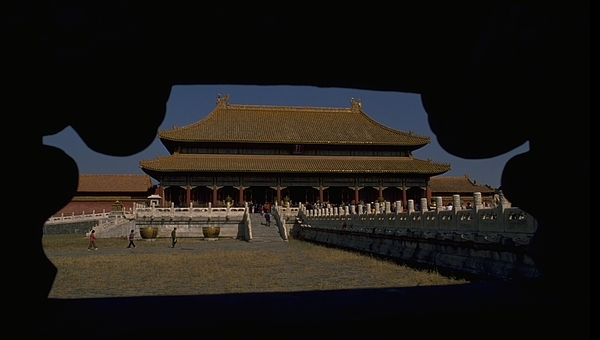 The Forbidden City (Imperial Palace), in Beijing, was home to fourteen emperors of the Ming dynasty (1368-1644) and ten emperors of the Qing dynasty (1644-1911). Listed by UNESCO as a World Cultural Heritage Site in 1987, the Palace Museum is located in the centre of Beijing, on the northern side of Tiananmen Square. Probably photographed by every tourist visiting the Chinese capital, but few will get down on their hands and knees to find an angle like this; then wait for people walking through the frame to create a balance. Outside the Russian Kremlin in Moscow. It is a sunny day in late winter. There is no longer snow on the ground but it is still very cold and spring feels a long way off. The lack of foliage on the trees allows us to see through to the golden onions of the Russian Kremlin Churches - the Assumption and Annunciation Cathedrals (left) and Archangel's Cathedral (centre). The Ivan the Great Bell Tower - said to mark the exact centre of Moscow - is the tall golden dome on the right. In Russia, the word Kremlin implies a medieval, inner-city fortress. In earlier times it would have probably meant a fortified town, or town surrounded by a wall. There are therefore a number of kremlins in Russia; although when we talk about The Kremlin, we usually mean where the workings of power take place in the Russian capital, Moscow. As well as being the official working residence of the Russian President, the Moscow Kremlin also houses Russia's main museum. 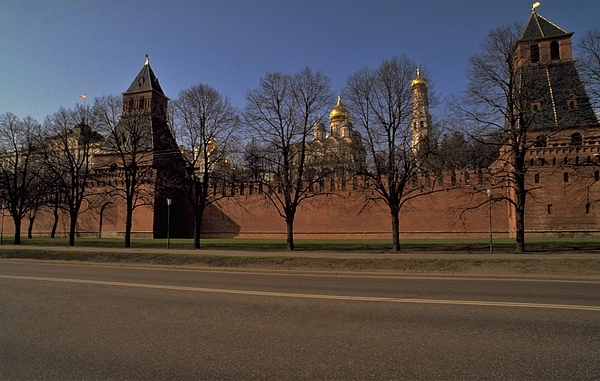 The outer red brick wall of the Moscow Kremlin was built at the turn of the 15th and 16th centuries; replacing the earlier fire hazard, made of wood. The tower on the left is The Secret (Tainitskaya) Tower and to the left of that is The Grand Kremlin Palace. 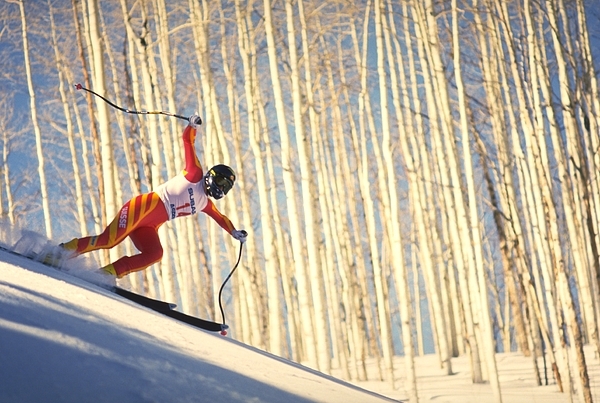 Skiing Ruthie's Run in Aspen, Colorado; one of the classic Downhill runs in North America. Aspen Mountain, known locally as Ajax, was founded in 1946; as the first ski area venture of the Aspen Skiing Company. Available as a framed print, this unique travel photograph was used on our 2017 Travel Photography Calendar. 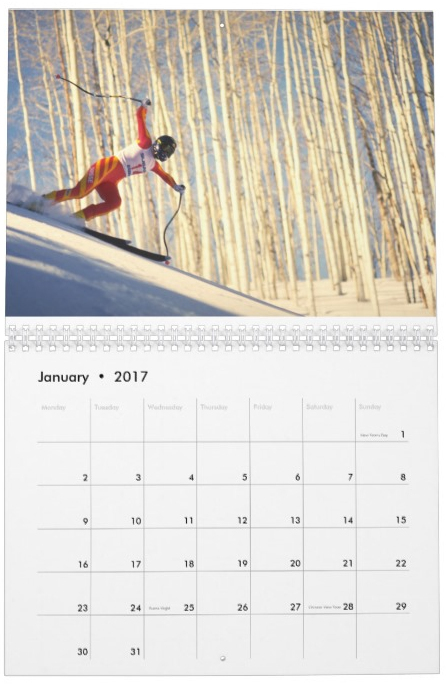 Ruthie Humphries made the initial $5,000 donation that enabled Aspen to host the first major international alpine ski championship held in North America; the 1950 FIS World Alpine Ski Championships. In 1987, on a warm, sunny spring day in the mountains of Colorado, Switzerland's Pirmin Zurbriggen (already the overall winner for the Ski World Cup series) made history in Aspen; by winning both the men's downhill and the giant slalom. He was followed in second and third places by Swiss teammates Daniel Mahrer and Karl Alpiger. 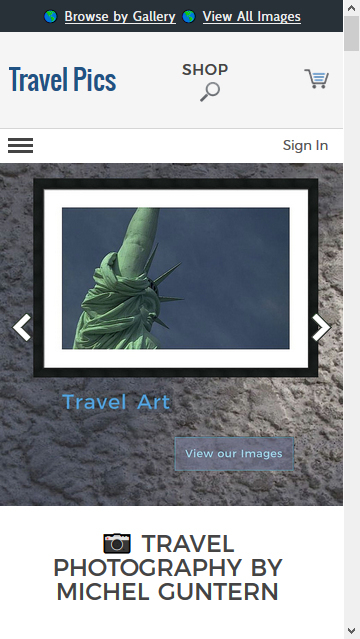 Win a year's free hosting for your travel images on Fine Art America. Yes folks, that's the prize up for grabs at the end of 2016 in our Travel Photographer of the Year contest; and it's free to enter! We've talked about this before in our Top Travel Pics Group discussions; I just needed to work out the fine details and get the timing right. The suggestion was to create a number of keyword subject contests over the coming year, with competing photographers earning points in each contest as they work towards a final score. Some of the travel photographers in our group helped refine the keyword suggestions. An image entered in one our travel photography contests should not be entered in another, so I didn't want too much overlap in the keywords used. Animals, Architecture, Autumn, Beaches, Boats, Bridges, Castles, Cities, Coastal, Cycling and Cyclists, Doors, Festivals, Food and Drink, Fountains, Historic, Hotels, Lakes and Rivers, Landmarks, Landscapes, Markets, Museums, Mountains, Nightlife, People, Reflections, Religious Buildings, Rural, Seascape, Spring, Sports, Streets, Summer, Sunsets, Towns, Transport, Trees, Up Close, Urban, Village Life, War Graves and Battlefields, Waterfalls, Windows, Winter. I was thinking about three contests a month (on the 1st, 11th and 21st) but have decided to settle on two a month. The travel photography contests should start on the 1st and 16th of each month and run for fourteen days, with seven days open to voting. The Autumn Travel Photography contest will be used to kick off the series. Up for grabs is three points for an Editor's Choice award and a bonus point if an image was taken specifically for the contest and posted in the contest's discussion thread in the Top Travel Pics forum. One (People's Choice) point will also be awarded to an image near the top of the Winners leaderboard (with at least five votes) when public voting is finished. Photographers may invite people to visit the contest to vote but not specifically ask them to vote on their entries. The travel photography contest is open to anyone with photos hosted on Fine Art America. If you're not a member, create your own artist website (for free). A free account allows you to host 25 images; which will cover two entries a month for the next twelve months. Our travel photography contests are sponsored by the Top Travel Pics group. All contest entrants are encouraged to join our community discussions. ✈ 2016 Travel Photography Contest - Keeping Score. Wraptious - a Manchester-based, award-winning creative community and shop, supporting artists and illustrators with a small share of the profits - is looking for new artists to showcase. I chose to submit three images from Around The World: New York, Sydney and Vietnam. If you live in the UK and would like to snuggle up to these vegan suede cushions while you dream of distant shores, then you can profit from free shipping. Liberty Island is a federally owned island in Upper New York Bay, best known as the location of the Statue of Liberty. The copper statue was designed by Frederic Auguste Bartholdi, a French sculptor, and built by Gustave Eiffel. A gift to the United States from the people of France, the colossal neoclassical sculpture was dedicated on October 28, 1886. The statue is of a robed female figure bearing a torch and a a tablet evoking the law upon which is inscribed the date of the American Declaration of Independence; July 4, 1776. 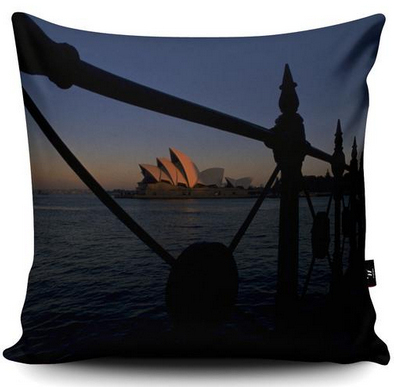 Sydney Opera House (UNESCO World Heritage site) at dusk, taken from an interesting perspective on Olympic Drive. This photo was used on the cover of Nomadic Gatherings: Travels in Asia and Australia. Two Vietnamese women wearing the traditional conical hat (Non La) to protect themselves from the sun while working knee-deep in paddy fields outside Hue, along the central coast of Vietnam. 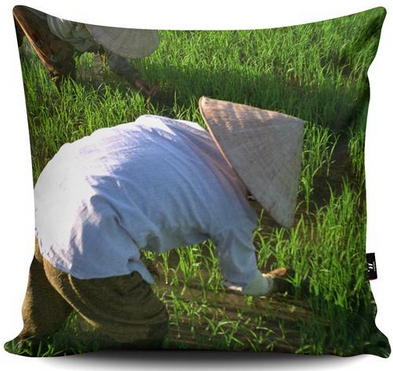 The word 'paddy' is derived from the Malay word padi, rice plant. If you buy all three cushions, bringing your basket size to �50 or more, Wraptious will even ship to anywhere in the world - for free. But get in quick; the cushions entered in competition are available to purchase for a limited time only. Eight artists will be shortlisted based on points, gained from either Facebook likes (1 point) or cushion sales (50 points). Points will count through to November 13th, so even if you don't have the money to buy you can still visit your favourites and give them a Facebook Like. A further five short-listed entries will be chosen by Wraptious. These entries will then be shared with a panel of over 30 expert judges from trade and retail across the United Kingdom. People photos may be of celebrities or complete strangers, paparazzi pics or a form of documentary photography; where a street photographer tries to capture a visual moment and convey something of a person's story like a photojournalist. Many photographers seem to think of travel photography as focusing on landscapes and buildings; maybe even playing around with a tripod to get everything looking just right. But some of the best travel photography is of the people in the places we travel to; candid photos of the locals doing things, often in the street or place of work. Good candid photography attempts to capture people acting naturally; blind to the camera, unaware of the photographer, and probably not looking directly in the lens. The People Travel Photography Contest is a part of the 2016 Travel Photographer of The Year Competition. With 2016 being a Leap Year uploading a daily travel photo would become something of a Project 366. Although it was already January 2nd in Europe, I managed to upload the first photo before midnight on January 1st, Eastern United States time. ► Travel Photography on Demand. 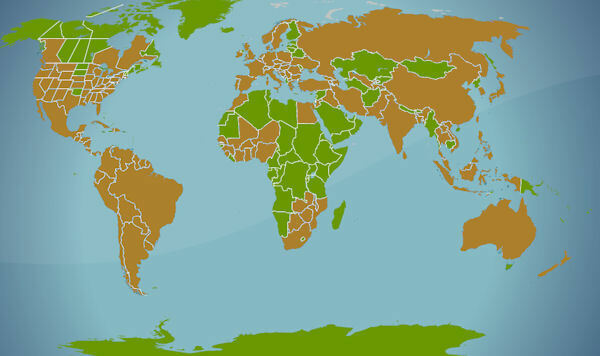 The trouble with using an interactive web application to generate a map of where we've been is that it tends to fill in colours of the whole country or state that we've travelled to, or through (light brown in this example) even if we haven't really covered that much territory on the planet itself. Of the 120 countries or so that I've visited, some were really only border regions so the map of my travels does look a lot more impressive than it really is. A cities visited map gives a much better indication of where we�ve really been to, but it takes so much longer to click on all the place names; so long, that I haven't found the time to complete mine. I guess I never will; there's just too many cities I've visited, in almost half a century of travel. Then there's the question of how much we can actually remember of the places we've visited and how much has been clouded by the passing of time. Thankfully I always kept Travel Notes on my voyage of discovery and used a camera to caputre images of the places I visited; although much of the material still has to be digitalised. Even all the postcards I used to send home, when hitch-hiking around Europe as a teenager, help me remember the good times on the road and bring the places back to life; although my handwriting wasn't always at its best. Something I've been meaning to do for a long time is to better curate my travels. People often ask me how I managed to visit so many countries and I've even surprised myself at how much they've all added up over time. I've always been interested in maps, I guess, and when I travel somewhere I prefer doing as much as possible overland; to better help me appreciate the geography of the place. I am a frequent traveller, but by no means a frequent flyer. I'm much more comfortable in a train station than an airport; even service stations are more refreshing. This page will be used as something of an index as I attempt to look back and map out where I've been on my travels, and maybe even inspire you to visit somewhere new. Feel free to share where you've been or where you'd like to visit in the comments. Queen Elizabeth II, Britain�s longest-reigning monarch, will be 90 on 21st April, 2016. To celebrate we've put together this special Royal Collection. At the age of 25, Princess Elizabeth became Queen when her father passed away, while she was staying in a remote part of Kenya; on Wednesday, 6th February 1952. The Coronation of Queen Elizabeth II took place in Westminster Abbey on 2nd June, 1953. 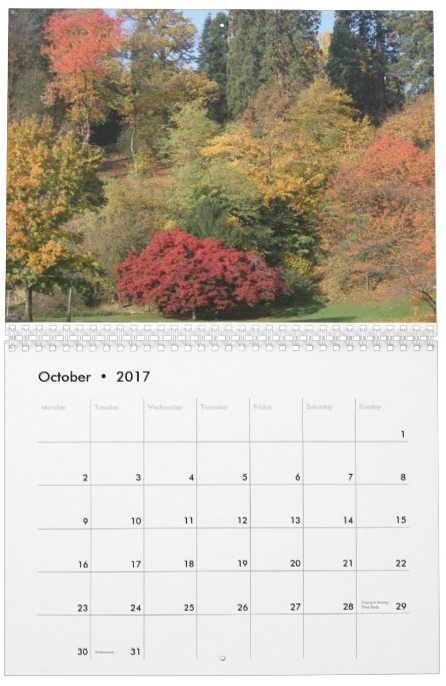 Fine Art America might not offer calendars for sale but some of my wall calendar photos are available as museum-quality prints or beautiful throw pillows. Her Majesty The Queen studies the horses before the race. Click on an image to see the larger version. All photographs copyright Michel Guntern (Travel Pics). Autumn is a great time to hit the road with your camera and share the results of your leaf-peeping with a worldwide audience. Show us where you've been lately and what inspired you to click the shutter and capture the Colours of Autumn. The Autumn Travel Photography Contest is a part of the 2016 Travel Photographer of The Year Competition. Who makes the biggest Impression on you? Or do you prefer a self-portrait by the master of portrait art? https://t.co/Kj9k1Jye7G - #FAAholiday via @FineArtAmerica � Michel Travel Notes� (@TravelTweet). We believe it's extremely important that these images are seen and appreciated by as many people as possible and hope to increase our collection of ready to print masters for your visual enjoyment. From Algeria to Zimbabwe, pyramids to safaris, Africa has so much to offer the adventurous traveller. Welcome to the world's second-largest continent. I don't claim to have visited all the countries in Africa, nor half of them, but I have travelled through West Africa, the Southern portion of the continent, and parts of North Africa. When you go into Africa, you have to decide what it is you want. 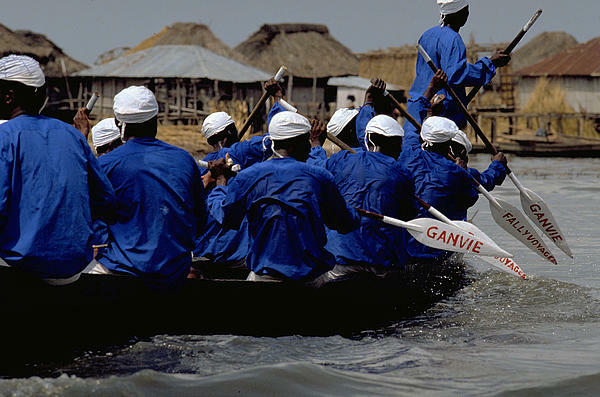 Overland tours are a great way to see some of Africa's diversity. You'll see a lot more of the land travelling across it; although not everyone has the time to travel from Cairo to Cape Town, by bicycle. For holiday-makers, a two week break in Kenya, blends beautiful beaches with loaded game parks - as the tourist brochures would have it. There is snow on the peak of Kilimanjaro, and minerals in the ground; bulging rivers and enormous deserts; wealth and poverty. Some of the tribes are picturesque and famous, while others survive in the bush and would rather be left alone with their spirits, than be clothed by commercialism. This is the First, not the Third World; and mystic writers cover the traditional peoples well enough for the reader to fantasize about their lives. Then there are the countries ruled by the largest tribe. Rife with corruption they provide ridiculous wealth to a few close relatives, and poverty for the masses. This is the real Africa, and to come away from here leaves one asking questions about change. The soul-searching is hard, the questions complex, and helpful solutions harder still. Life in much of Africa is on the streets, everything is bought and sold in the markets. The clothes on the women are light and colourful, and music from the heart of Africa beats deep in all souls. If you're on a guided tour in Africa, your chances of encountering problems are minimal. Tour operators make it their business to know the areas they travel to, so you are never at any undue risk. If you're travelling alone in Africa, be sure to keep up-to-date with local news; so that you're fully aware of potential hot spots. To give you some idea about what travelling in West Africa entails, let me take you back to Being in Benin, and the route from Niger. Or perhaps you'd like to start out, like I did, by Landing in Lagos.